Rusty screws under the dash. These screw heads are easiest to inspect and most likely to lose their paint under normal conditions of use. The trick is that without paint or protection, the bare metal of these screws will rust quickly after being exposed to water. Under the hood and around the doors are other good places to check screws. Trunk odors. The trunk might be one of the most difficult places to completely get rid of mud and mildew, and you’ll be able to smell any issues. An overpowering scent of cleaners or bleach can also be a concern. Again, if all the carpeting was just replaced, you should ask about it. And be sure to check the wheel well, where the spare tire is kept — that’s a great place for mud and debris to collect after a flood. Mud under panels or brackets. Look for places that would be hard to clean. A used vehicle is going to have some accumulation of dirt but it shouldn’t look like mud was just wiped off on those areas. Most flood damage cannot be repaired, so be wary of any private seller who claims they have reconditioned their vehicle after Kansas City floods! If the vehicle hasn’t been repaired by a qualified Kansas City body shop, mechanic, or service center, you should be cautious. Corrosion that begins with the water exposure can continue to weaken key components of the vehicle. Important fluids can get diluted and have ongoing effects from not being the right strength. The electrical system may be compromised, and that can lead to issues with safety features like seat belt warning lights and airbag sensors. In addition to physical signs of water damage, some flooded vehicles may have rebuilt or salvage titles without specifically indicating that they were submerged. However, if the previous owner did not make an insurance claim, the title may be clean. If you have doubts, it’s best to look somewhere else for your used car. So, when you see indicators of flood damage, it’s best for your pocketbook if you just say, “No thanks.” Even a car or truck that’s been reconditioned may have ongoing issues that simply can’t be fixed through drying out and replacing upholstery or carpeting. You don’t have to get stuck with a lemon or a flood-damaged car. With a thorough inspection and common sense, your chances of spotting water damage are high. And remember: To make sure you’re buying a reliable used vehicle, look for a certified used program at your dealership. 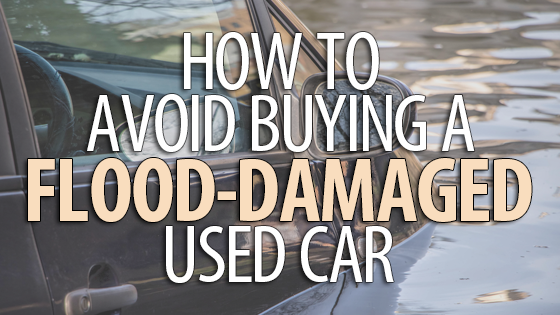 It’s illegal to sell a flood-damaged used vehicle, and do you really think a car dealer would take that chance? It’s your safest bet. Good luck with your search!